Rachel Zoe's signature line of faux fur vests has made quite the mark on this year's trends. 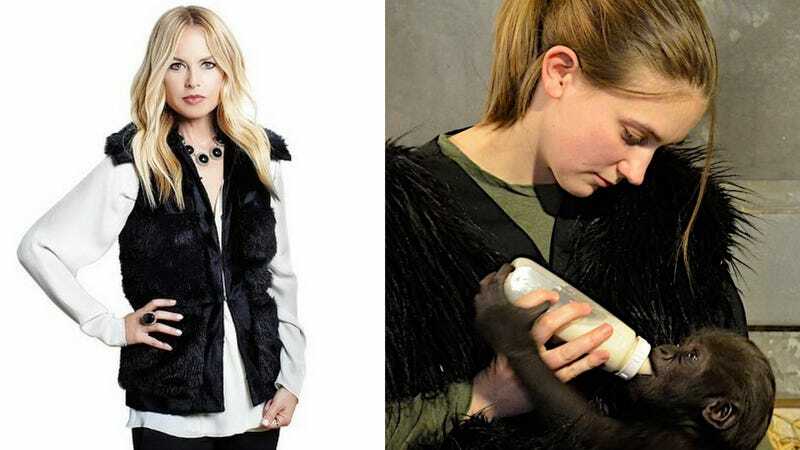 Fashion's latest darling, the Cincinnati Zoo's new baby gorilla named Gladys, has come to embrace Zoe's classic fashion piece... literally. Gladys is being temporarily raised by human surrogate parents, reportedly preparing for a transition to a new gorilla family. In the meantime, the fashion diva insists that her parents wear Zoe-esque black faux fur vests. "Vests are incredibly important to Gladys' gorilla-fication. The day a baby gorilla is born they can pretty much hold on to mom without any support," said Ron Evans, Primate Team Leader at the Cincinnati Zoo. "It is very important that Gladys has some good hand holds and when she's on these vests, she sticks to them like Velcro. She's very comfortable on them and feels much more secure in her ability to hang on like a gorilla should." According to Zoe, her classic fur vest "looks ba-nanz with everything." Har har. Get it? Bananz? But instead of buying Rachel Zoe's original vest, Gladys insisted that her surrogate parents have custom-made vests from the Kentucky-based Donna Salyer's Fabulous Furs. Zoe, who undoubtedly feels betrayed by baby Gladys, could not be reached for comment. Image of Rachel Zoe vest via QVC. Image of gorilla vest via the Cincinnati Zoo & Botanical Garden.